Calvin is just loving this cooler weather! He literally frollicks this time of year. It is so fun to watch him play. Just love that little guy. My WEstie(Calvin Kline) is extra dirty this time of year. I only want to have him groomed once a month. Any idea's on what to do in the meantime?? So very excited! The thunder shirt came in today!! And it is a rainy day too boot!! My DH was very sceptical at first but it seems to be working!! Calvin is so calm he is acting like it is a normal day and not stormy! Already not regretting the purchase. WOW I am so sorry that I waited so long!! Still waitin for the shirt. Hope it is in by the weekend because it is going to rain all weekend. love yor dog a little more today just because westie's are the besties!! Did it! !n hunder shirt on way !! Got free shipping too!! Just got the grey one can't wait to see it!! okay okay after much procrastination I have ordered the shirt!! I too live in Pittsburgh area and we are getting too many storms this year. My Westie loves to swim!! I think he thinks he is saving us from drowning!! Funny because he is so small!! kirby barks the whole 20 mile ride to the vet and groomers. does the product work for that situation too?? if so plese post the name of it. i give him 2 pills from the vet but they don't really work on him. the groomer said for his ext visit to try bringing him without the pills to see if he will do better without them. i'm looking for something different to give him to calm him down so he won't try to bite her. Hello! My name is Janna and I haven't been on in so long because my teaching job this year has been so stressful, but I am moving to a new school last year. Anyways, I have a friend who has a friend who actually ordered the thunder shirt and said it has worked wonders. I want to get one for my older westie because she hates riding in the car when it rains. The wipers and semi-trucks scare her. She did really good on the drive from Philly to Pittsburgh with the 3 tunnels. Thank goodness it didn't rain. Just another thought. I got this natural pet pharmaceuticals for itchiness because my scottie gets breakouts on his belly and it has worked wonders because I don't want to keep giving him medication every couple of months. But they have a natural remedy for stress. It is just liquid that you either put in water or pour down their throat, but I put it on his food. Short term goals are to finish the 60 days of insanity! Only have desserts one night a week. Eat clean all week!!! welcome back !! i'm so glad you and calvin had a great time camping. it's so funny he was digging so much he slept all week!! did he find anything?? Sorr I have been absent. Calvin and I have been camping!! He is such a DIRTY camper!! Loves to dig dig dig. He was soo tired he slept for a week afterward!! We got him a new dog bed and he just loves it!! that's so funny!! calvin had to go teach the other terrier all about westitude !! lol. i think it got the point..... westies rule !! i guess those dogs wonder why he can come up to them but they couldn't come out to him !! they must have really gotten scared of him now!! on another note.. my daily walk with Calvin goes around this charming little house with an electric fence(underground kind) . The two dogs that live there can't wait for Calvin and I to get there everyday (well,almost). This has been going on for about a year now(with the winter off). Well, yesterday Calvin finally got the courage to go across to see the dogs. They have come nose to nose a couple of times and that is it. Ha the little stinker tried to attack the weaker older dog. And I thought they could be friends!! HE likes the weiner dog and the lab but not the other terrier. Interesting; and boy oh boy what an attitude he had for the rest of the night!!! ON the shirts ..not in yet. Thunder shirts?? I never heard of them before. Interesting concept. Let us know what you find out. I certainly won't need one for Buddy & thunder... this little guy loves the stuff. I think he thinks its another dog challenging his authority! The lightening... he gazes out the window in amazement! I've never had a dog quite like him. "When it is obvious that the goals cannot be reached, don't adjust the goals, adjust your actions." Let us know how it works for your dog. I was thinking about ordering two as we have one little westie that just whines and cries whenever we take her in the car. She always exhausts herself on the return trip & is just fine, but heading out she drives everyone crazy. The thunder shirt may help her also! I am so going to check out those thunder sweaters. I do not want to drug my dog. I do not believe in it unless you have no other choice. Thanks , never knew it exised!! I am so excited. i think you are refering to our faux westie of the team. julie_may has a part carin, part mini schnauzer that looks like a westie. she is ailie and has big ears and is sooo adorable. you'll have to see her picture and you'll swear she is really a westie!!! Catherine, I'm so sorry that I missed your post. I haven't ordered the thundershirt yet, but I plan to. We have one westie that just pants & shakes the whole time we have a storm. I'm wishing we had already ordered it as bad storms are forecasted for tonight through Wednesday. Google thunder shirt for dogs and you can watch a video on them. One of my friends on another forum swears by the one she ordered for her dog. Sally, we were stationed at RAF Bentwaters, which I understand is now closed. We lived in Ipswich & Felixstowe and our youngest daughter was born at RAF Lakenheath. We lived there for three years and even took a ferry to Belgium while we were there. We loved the history & architecture. We hope to go back to visit one day. I still keep in touch with a friend who lives in Ipswich. i do apologize? snowy is a westi and my son mark does bsl ands signs snow. for snowy????????? i bet you laughed your head off. Leader of: OsteoArthritis in (Hips or knees) Mild or Severe!! that is so great snowy knows british sign language!! was it hard to teach her?? mrscritters moved from the u,k, in 2009 to california, usa. her sparkpage doesn't say which part of the u.k. she lived. you can send her a goodie or a sparkmail and see if she had lived near you. feel free to talk all you want about snowy, we are crazy about our westies and love to read everyone's stories. i can talk about snowy. welcome to you and snowy!!! i'm debra and i live at a farm at tuscaloosa, alabama with my 2 unrelated 7 year old westies kirby and la la la. i think the westie team is sparks best kept secret!! 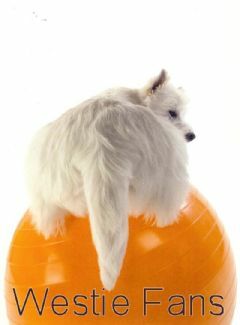 it's the best team with the nicest group of people who love talking about our westies as we get healthier. we have another member from the u.k. MRSCRITTERS, you'll have to check her sparkpage out and see her 2 westies. what did the vet say?? ella...westiegal... just posted she has ordered a thunder sweater for one of her westies. you should check with her about the sweater. Calvin is going to the vet today. It is time for the 2nd of his 2 part lymes disease shot. I am going to mention all of this to her. My husband th inks the same as you do. Alittle something to help him through the storms.I don't want him to have a heart attack over them. We love the little guy so much,I don't know what we would do without him. Gee I don't know. If you think that storms make he that terrified maybe you should ask the Vet for some help with a tranquilizer or something. I am a little worried about Calvin and these storms. He threw up yesterday he was so scared and then he slept on my floor most of the night terrified. He later came out of it and laid on my bed. He is just exhausted today. Do you think he could have had a seizure? I can't believe he likes them. You have a very special amazing westie!! So many dogs are afraid of thunder storms! I find it very amusing that Buddy sits at the window and watches them in amazement! We have another storm due here tomorrow night. my little sweetie is so afaid of thunderstorms. I find him hiding all over the place,(behind the computer, behind the toilet) He shakes like a leaf and has a sad sad look on his beautiful westie face, i gave him extra love and hugs. Poor baby. i'm so glad he's better. it's great he gets to go to work with you and entertain everyone!! Calvin is up and moving today!! He is just so sweet!! I took him to work with me just so I could selfishly spend more time with him. i live in alabama at a farm and we have a lot of ticks. i think it's because of all the trees here. kirby and la la la take a heart worm pill.... sentinel.... it has built in flee killer so we don't have the flea problem. when they were puppies i got a flea collar for them but i have allergies to things that have smells and fragrences. i was so allergic i had to take them off and throw them away after 10 minutes. we use the drops on their backs and they work. i hope calvin feels better today!! Have you had any problems with ticks?? Last year Calvin had quite a few. I think it is the white fur. We had him tested for lymes disease yesterday(negative) Now he is getting an innoculation for it. Poor Baby He slept the rest of the afternoon and evening. Sorry... some how I missed this post! Sounds like everyone is doing fine! Buddy loves to be brushed. Today we went shopping at Costco and the weather is finally nice, but not too hot, so we took the Bud along for the ride. He loves it! Our Westies sure draw a lot attention! Everyone thinks they are so cute! Brushed my lovable adorable Calvin Kline today. He was so thankful. I hope he is just as nice when we go to the vet on monday. Spring check up and flea med visit. So funny!! What would you do without them?? My life is so much more with my westie in it!! GAve my dog a bone last night ( it was big enough) Calvin was so funny with it. He is carrying it around in His mouth whining because He needs so badly to swallow but too greedy to put it down. he did this for about an hour. How adorable!! I love it right after grooming too....Shorty just got his done on Saturday and he is getting spoiled. My cute little dWestie dCAlvin Got a bath and a haircut today!! He looks adorable!! I am going to love him up and spoil him rotten! That's funny. Buddy loves it when Hadleigh comes over (or any of the grandkids) but after they leave... he CRASHES! Lays on his back with all fours up in the air like a 'dead dog'! LOL!! that is so cool he gets to hang out with you all day. i bet he really loves all the attention and petting he gets. on top of that getting to sleep on the couch all day ........isn't it wonderful spoiling our westies !!!!! Took Calvin to work with me today! He is sooo tired!! (tired of being petted to death by all the customers) I own my own hair salon so it is possible to take him to work. all the locals love him but he is spoiled rotten!! Anyway he is sleeping on the couch and will probably stay there until I go home tonight! What a sweetie!! We live in nothern IL and are anxiously waiting for spring to officially arrive and stay a while. Thanks for introducing yourself and saying hello. "You have three choices in life: Give up, give in, or give it all you've got." I live in Burlingame, CA with my husband and two westies. Jess who is 4 and Bluey who is 3.
welcome to you and calvin to the team!! i'm debra and i live at a farm in tuscaloosa county, alabama with 2 westies kirby and la la la. they love to get into everything you'll soon learn. that's so great you have a job that lets you bring calvin to work with you !!!! i know you'll enjoy the team............. it's the best there is !!!! Welcome to the team! My name is Becky and my Westie is Buddy. We live in No. Calif. My DH and I are retired with an empty nest. We now spend our days watching our youngest (1yr)DGD Hadleigh 3 days a wk... which will probably increase to 5 days a wk in the near future. It's been fun taking care of her and watching her grow. This is one reason why I am sometimes late checking in, so please forgive my tardiness. Welcome Kathy and Calvin! What a cute name! Is there a story behind it? I think it is great that Calvin goes to work with you!! This is a great group and I hope you enjoy it as much as I do! Hello Cathy welcome to the Westie team. My name is Lisa and my westie's name is Shorty, he is 4yrs old and TECHNICALLY he is my daughters dog but I think I am more attached to him and him to me. That is awesome that you can take your westie to work with you! Hello my name is Cathy and my westie's name is Calvin Kline. I love him so much. Best dog I have ever had. We love to walk and play ball together. Sometimes I take him to work with me.